Ed Sheeran fans will be relieved to know that the ginger-haired troubadour isn't dead, nor is he an 82-year-old mechanic named Svavar Gunnar Sigurðsson — though an Icelandic newspaper reported otherwise earlier today. 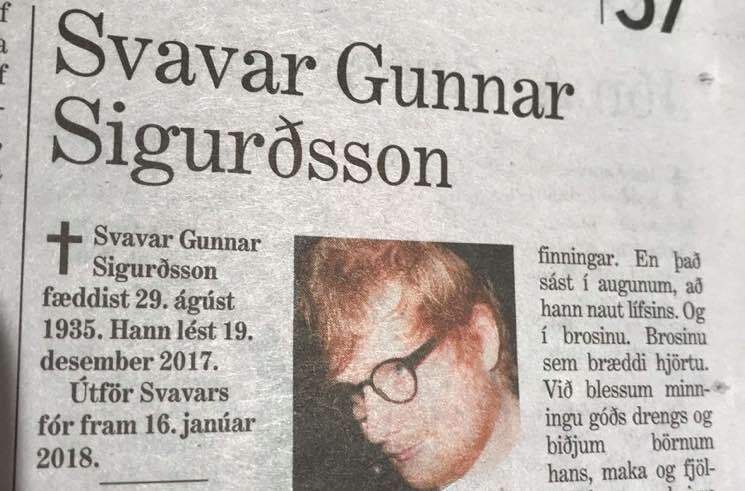 Sheeran's instantly recognizable photograph appeared in the obituaries section of Iceland's Morgunblaðið this morning, next to a textual tribute to the real Sigurðsson — prompting some fans to momentarily worry that the UK pop star had passed away. It was quickly identified as a mistake, however, and fans are now having a field day with it on Twitter. See some of the reactions below. It's not Sheeran's first near-death experience in Iceland, either. The dude — yes, the real Ed Sheeran — stepped into a geyser and boiled his foot on a trip to Iceland last year.